I highly contest the notion that it’s a given that highways always “fill up” every time there is expansion of the residential areas. There are many areas of the country where there is a rich highway network, that allows efficient sprawl, and conversely the highways can be free flowing and allow for distant living. If you think about it, there is no reason that the highways necessarily aways fill up unless you presume an endless birth of humans. And the birth rate in the US, sans immigration, has been at or below replacement rate. I look at a city like Portland, which has a rich exurban network of highways and where inside “the city” you can jump on an off a highway very readily. At the same time Portland is consistently rated as a number one bicycling city…and it keeps its bike routes off the beaten track. Reason? Because it doesn’t use its neighborhood streets as highways. A rich network of highways where a person can travel no more than half a mile to access one is a beautiful thing. I would go so far to say that such a network is more valuable, more efficient and “Greener” than any “mass transit” system ever devised. Having cars be able to pull out of city streets and onto limited access highways for the majority of their trips means safer streets and a place where any low volume street can be a “bike path”; as oppose to the “vehicular cycling” design which you amply skewered in another article. Induced demand kicks in if you have continued growth, and it can take the form of suburban sprawl. That’s still true in most of North America. 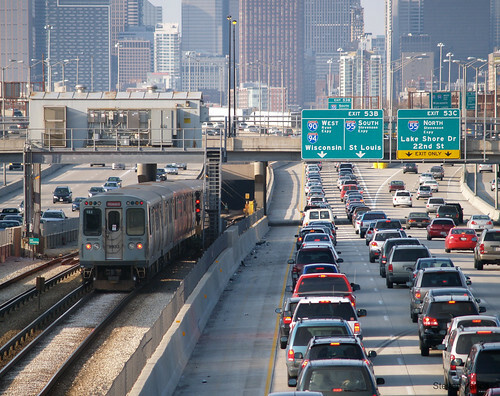 However “efficient” the long-distance urban trips on limited-access highways, these highways are really expensive infrastructure — both for the environment and financially.